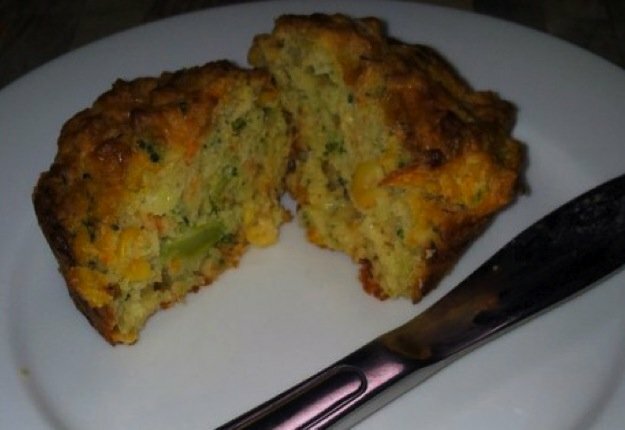 The great thing about these vegie muffins is that you can add whatever vegies you like. I chop up a small head of broccoli to add to them and always mean to add some spinach, but keep forgetting! My 16 month old little man LOVES these! Preheat oven to 200C or 180C fan forced. Brush 12 large muffin cups lightly with oil. Sift flour into a large bowl and add carrot, zucchini, corn and cheese. Stir to combine and make a well in the centre. Spoon mixture into prepared tins. Bake for 20 mins until risen and golden brown. Leave in the tin for 5 mins then lift out onto a wire rack to cool. These would be great for school and work lunches or after school snacks. Think a double batch of these are in order and the freezer will be happy. oh yum, would be great to just have in the freezer and pull one out for lunch too! nice and easy, thanks for sharing. Mmm, as a vegetarian these would be perfect as a snack for me, and also fantastic for school lunches. Win win! Great for the lunch boxes! I find also, by grating the stalk of the broccoli you can add more of it to the mix without the kids getting grumpy about eating the stalk! These will be great for work lunches and school. my girls love these! So easy too! Great for lunch and l’ll add spinach as well,won’t forget! Thanks. Thanks for sharing. These look good and healthy. Yummy! What a great way to get the extra veggies into the kids. Love this recipe. Thanks for sharing!